LAST September, the Protestant Episcopal Bishop of California left on sabbatical for Cambridge University in England “to find . out what I really do believe.” The Rt. Rev. James A. Pike —m had just been cleared by his fellow bishops of heresy—the third such charge against him since 1961. What he believes is hardly typical of a bishop. “I’ve jettisoned the Trinity, the Virgin Birth and the Incarnation,” he told Look in his Cambridge flat recently. These were the heresy accusations of last fall. Bishop Pike also rejects the accepted views of God and prayer. “Everything I’m saying has a question mark at the end,” he explains. Even his musings will be controversial when he comes home. 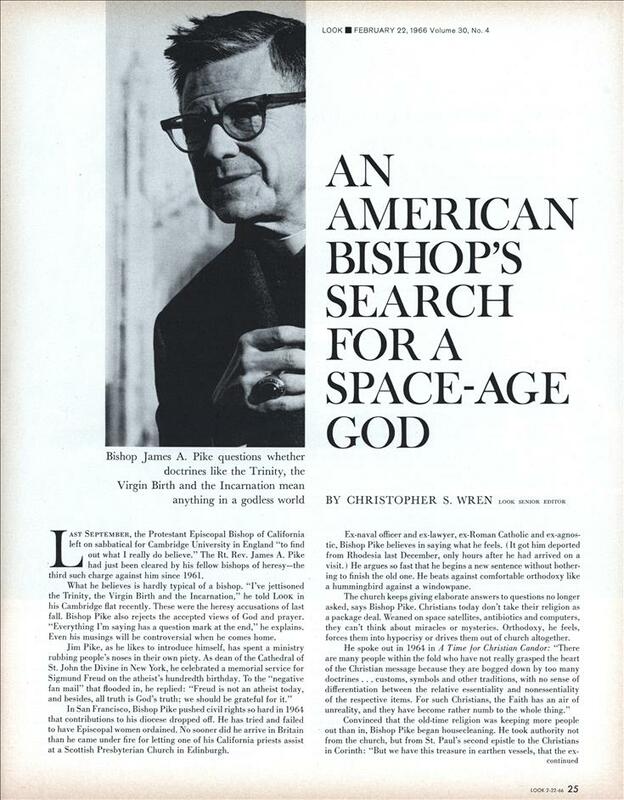 In San Francisco, Bishop Pike pushed civil rights so hard in 1964 that contributions to his diocese dropped off. He has tried and failed to have Episcopal women ordained. No sooner did he arrive in Britain than he came under fire for letting one of his California priests assist at a Scottish Presbyterian Church in Edinburgh. Ex-naval officer and ex-lawyer, ex-Roman Catholic and ex-agnostic, Bishop Pike believes in saying what he feels. (It got him deported from Rhodesia last December, only hours after he had arrived on a visit.) He argues so fast that he begins a new sentence without bothering to finish the old one. He beats against comfortable orthodoxy like a hummingbird against a windowpane. The church keeps giving elaborate answers to questions no longer asked, says Bishop Pike. Christians today don’t take their religion as a package deal. Weaned on space satellites, antibiotics and computers, they can’t think about miracles or mysteries. Orthodoxy, he feels, forces them into hypocrisy or drives them out of church altogether. Convinced that the old-time religion was keeping more people out than in, Bishop Pike began housecleaning. He took authority not from the church, but from St. Paul’s second epistle to the Christians in Corinth: “But we have this treasure in earthen vessels, that the ex- cellency of the power may be of God, and not of us.” Bishop Pike saw his task in salvaging the treasure from its outworn vessels. It was a manuscript, dictated like his other books onto tape, then typed and annotated in the Bishop’s tiny handwriting. But it was more radical. Bishop Pike took it alone: to England and crammed it with last-minute footnotes. What Is This Treasure?, to be published next month by Harper & Row, tries to recast the identity of Christ. Bishop Pike, like the late theologian Paul Tillich, believes God is not a Supreme Beins: over other beings, but Being itself: “God is not a passive God. He is like steam under a lid, and a person is the lid. “I don’t believe in a God that tinkers,” he says, in dismissing special prayer. “God is there all right. He’s not wishful thinking, but we’vegeot to get open to Him. God is a moving, dynamic reality, not a passive one. Sometimes, He gets through in spite of our notions. “That is why I reject the special Providence for Israel in the Old Testament, that they were supposed to knock the Canaanites out of Israel like we knocked the Mexicans out of California. The inquiry has inevitably led Bishop Pike to the enigma of Christ Himself. He sees Him not as Jesus among the lilies in a stained-glass window, but as a country carpenter turned itinerant preacher for three powerful years. Jesus, he says, bucked the existing power structure, pulled off a civil disobedience demonstration on Palm Sunday, and ended up a condemned criminal, with nails driven through His wrists and hoisted naked on a cross for execution. Yet even in very human suffering, Jesus was able to let God break forth as Love. God didn’t choose Christ, says Bishop Pike. Christ chose God. Put so starkly, Bishop Pike’s conclusions would seem to place him in a far-out theological orbit. He isn’t. Though bold for a bishop, he is several laps behind the fast-wheeling pace of modern Protestant thought. That is why he went to England—to try to catch up. Cambridge University, where Bishop Pike is staying, is the womb of what has been proclaimed—and condemned—as the “new theology.” (“I’m sorry my theological education was such that, at 52, I should be a novice,” he says.) Its innovators, mainly Cambridge dons, are reacting to a society throttled by secularism. Only ten percent of the English attend church. The working man, lost when the established church turned its back on him in the Industrial Revolution, prefers soccer or the “telly” on Sunday. Confirmations have dropped by a quarter in the last few years, candidates for ordination, by over a third in the last year. The 14,500 Anglican churches are more often relics of the past than signposts to the future. The everyday world, once reverent, has turned not hostile, only uninterested. Bishop Pike sees a forecast of what can happen in the United States. For seven years, the new theology stayed inside damp university walls. The theologians talked to each other, and few others heard. 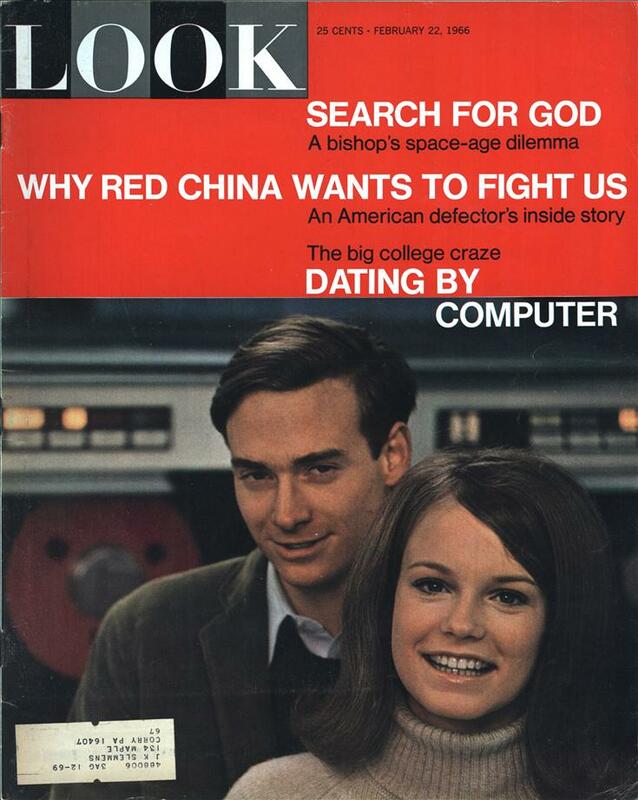 In 1963, the Rt. Rev. John A. T. Robinson, Bishop of Woolwich, while in bed with a slipped disk, spilled it out into a book, Honest to God. “Our image of God must go!” headlined the London Observer. Conventional clerics, shocked by such effrontery, suggested Bishop Robinson, a former Cambridge don, might go instead. Rival theologians flogged him as unoriginal and, in long-winded polemics, “muddled.” Only the public, amazed that a bishop would voice its doubts, approved. His thin paperback has sold nearly a million copies. Rudolf Bultmann had urged “demythologization,” abandoning the imagery of the Gospel writers to find what they were really saying, “freeing the Word of God from a bygone world view.” , Dietrich Bonhoeffer, an anti-Nazi pastor hanged by the Gestapo just before the war ended, said in letters smuggled from prison: “Man has learned to cope with all questions of importance without recourse to God as a working hypothesis. … As in the scientific field, so in human affairs, generally what we call God is being more and more edged out of life, losing more and more ground.” Bonhoeffer proposed “religionless Christianity,” a paradox he never lived to clarify. Bishop Robinson summed it all up. He said that God was not up there or out there, “a sophisticated version of the Old Man in the sky,” but was the basis of our very existence. He did not believe Jesus “was God for a limited period, taking part in a charade.. .. God dressed up like Father Christmas.” Jesus was human, and because He lived and suffered for others, taught Christians to live and suffer for others too. Bishop Pike had nearly finished writing A Time for Christian Candor when he read Honest to God. Impressed by its frankness, he threw out all but his first chapter and started again, this time, without hedging. Bishop Pike was delighted to be tagged “that American Bishop of Woolwich” in England. He has periodically visited Bishop Robinson at his London home. As unanswered ecclesiastical mail piles up in a washbasin on the study floor, the Bishop of Woolwich patiently listens to each new speculation of his visitor from California. The idiom of the new theologians has scraped the misunderstanding raw. Bishop Robinson says: “The ordinary man thinks ‘myth’ is unreal. In Honest to God, I was using ‘myth’ in a more technical sense of theology as a profound form of truth, not to say it isn’t true, but to say it is profoundly true at a deeper level than mere occurrence. A myth is using traditional poetic language to depict a profound truth. The outcry might have been worse. Says Canon Montefiore: “The clergy have little idea how lightly the laity sit with orthodoxy.” Bishop Pike thinks his support has come from “the inside of the edge of the church and the outside of the edge.” He defines the insiders as those who felt hypocritical, but hesitated to voice their objections. The outsiders wanted Christianity, but couldn’t buy the whole package. Bishop Robinson predicts: “The structure of the church as a religious club will inevitably find itself being squeezed out. If the efforts of the church are put into keeping it, it will survive as a museum piece, doomed to frustration. As the walls begin to fall, we’ll discover whether this will find us exposed for death or stripped for action. Wow. I knew that the Episcopal church had been disintegrating for quite a while, but I didn’t realize it started this long ago. Hard to imagine a church that allowed a man in such a prominent position of authority to continue preaching things so blatently against their beliefs for so long. It must have made for some strained conversation with Reverend King, an orthodox Christian clergyman. It’s hard to have a firm church foundation when your church exists basically because Henry VIII couldn’t keep it in his pants. I wish American churches today had even an ounce of Bishop Pike’s honesty and intellectual courage. Submitting to a rigid orthodoxy does not make one a better or more ethical person. I just wonder why you would want to remain a Bishop of something you really belive in any more….. good pension plan? Submitting to a system of rules which one has determined, through thought and study, to be the correct answers to how the universe is run, Who is in charge, and how we should respond to that does make one an ethical person, assuming that those rules are correct. Please un-subscribe me from your mailing list. I cannot find the link to do so on your website.